Andrews, who had grown up on a Georgia plantation, thought that the black slaves there were, as a class, more noble than white dandies who put on paper collars. The clerks who patronized minstrel shows in Northern cities thought just the opposite. 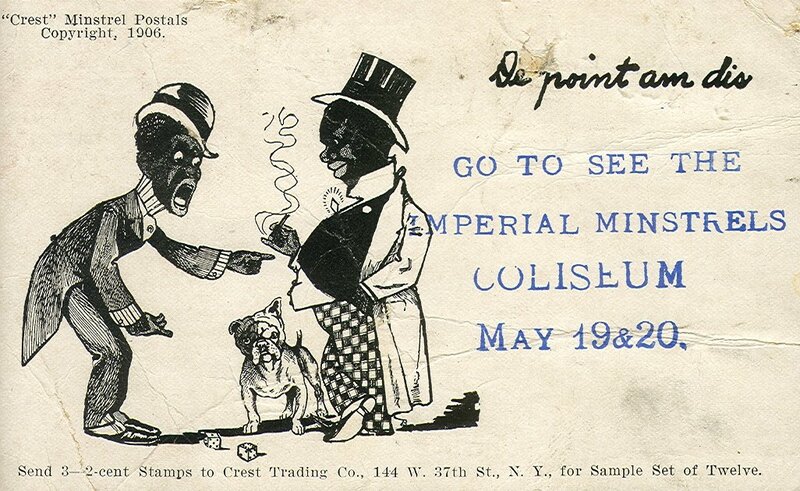 Paper collars were more than a convenience to the performers who blackened their faces with burnt cork and grease; they became a part of the blackface persona. Blackface had a long history of using racial disguise as an opportunity to act out social anxieties of all kinds. 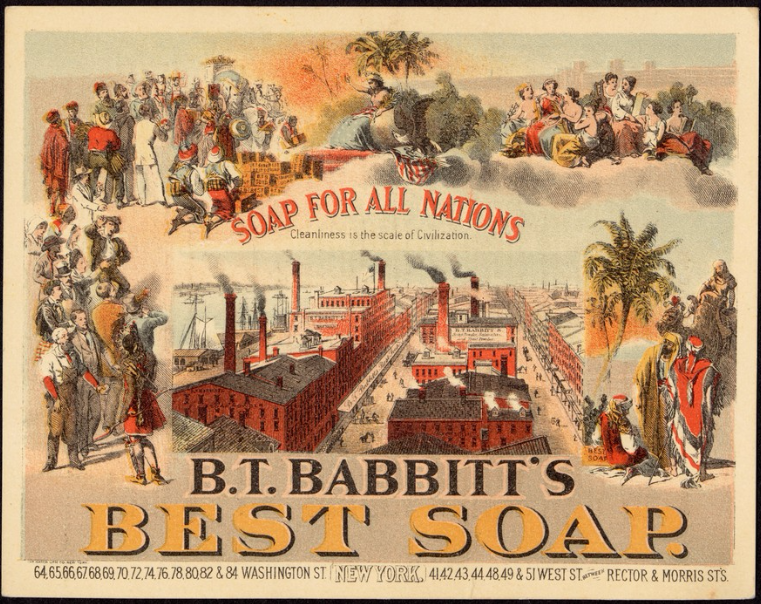 But beginning around the the 1830s, those anxieties often had to do with racial distinction itself. In Northern cities, white workingmen and junior clerks both began to resent free blacks, who competed for the same jobs and social opportunities. 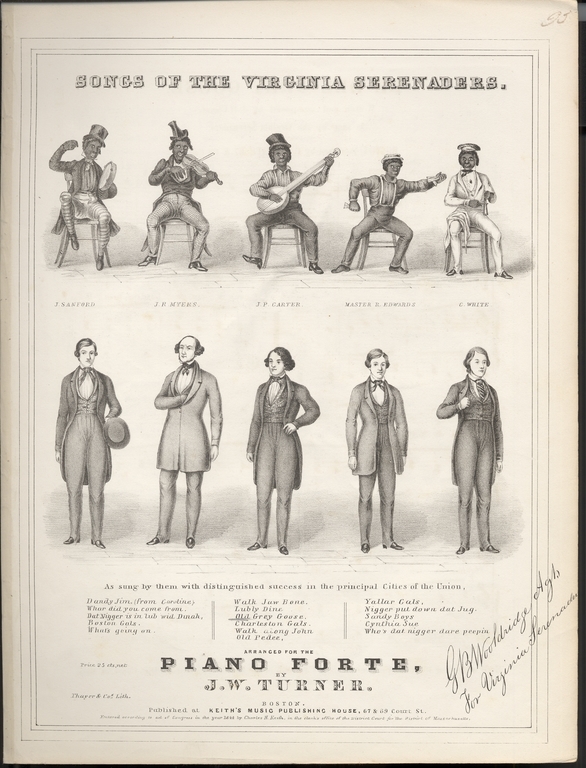 By the 1840s, racial performances had crystallized into specific and highly derogatory stereotypes. By measuring themselves against the black personas on stage, white audiences could overcome social differences and unify around their shared whiteness. The blackface characters of mid-century were slow-witted, physically awkward, and prone to all manner of vices. If the white dandy appeared ridiculous for dressing above his class, the black dandy appeared even more so. Tall collars immobilized the neck, enforced a straight posture, and drew attention toward the face. For white elites, this was a badge of distinction. Their daily activities required neither extensive mobility nor bending over a desk, and their faces were the essence of their identity in business and social dealings alike. But if the face reflected one’s nature, highlighting a black face had a perverse meaning of its own. Postcard, “De Point am Dis,” from a series published by Crest Trading Company, 1906. Collars and cuffs are on prominent display, and the stiff posture they enforce is evident in the figure on the left. Elsewhere in the American press, black South Africa offered a safe space in which to voice doubts about the state of society at home. Stories circulated about a tribal chief there who had adopted western customs and organized a local pageant to show off his civility. Midway through a speech, his paper collar “broke loose at one side and tickled his ear.” Batting it down to no avail, the chief exhausted his patience and tore the collar off, along with the rest of his English-made clothes. Then he turned and laid an axe to the dwelling he had built according to English standards of tidiness. “The whole thing is a lie!” he exclaimed; “I’m tired of their houses and their clothes and their false, mincing ways!” And he fled into the mountains where his heart could “go out to the woods to get its breath”—an instance of what the column’s title proclaimed as “nature asserting itself.” The piece continued on toward a moral: “Wiser men than the poor savage have found civilization too full of ‘little lies,’ and longed to back to nature for a free breath.” It was not just that Africans were ill-disposed to take on European manners; they were a convenient allegory for westerners’ misgivings about their own ways of life.